Handmade and practical, unique and simple! You can transform this plain diaper cake into very special shower centerpiece! 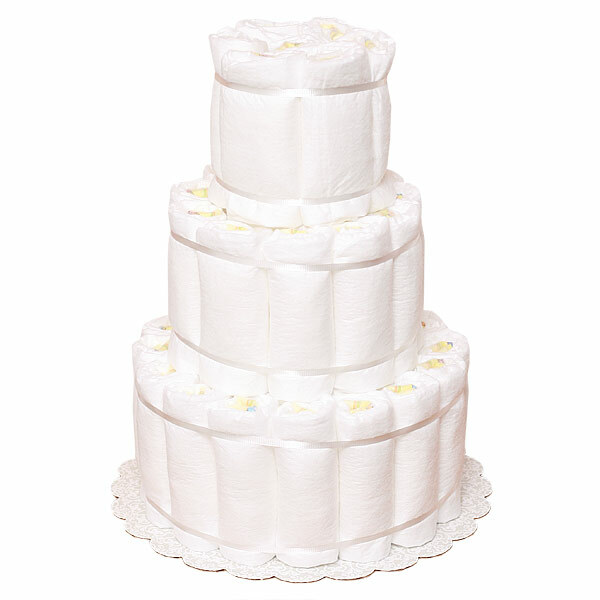 This cake is made of 50-55 rolled Pampers Swaddlers diapers size 1 (8-14 lbs.). Diapers feature stretchable Grip Tabs and soft, Cloth-Like Cover gentle to the touch for the precious one! The diapers are held together by curly ribbons (no glue on diapers). Cake is very sturdy and will not come apart during shipping. This cake will be wrapped in clear cellophane and tied at the top with curly ribbon. Dimensions: 12" in height, sits on a 10" Wilton corrugated cake board. All our diaper cakes made of highest quality ingredients with greatest care and love. Everything included is ready to use and easy to disassemble.